Wow that can be so scary with food allergy, it should be for all clear what they are eating, to be noticed on the package. Thank you for your article on this. Yes, it is really scary and being informed is the best way to stay safe. Food allergies, in fact any allergy, can be terrifying. There's also a lot of misinformation to go with the discrimination too. Absolutely, there has been a lot of media misrepresentation of food allergy! Definitely, I just feel so sad for the parents, these deaths should never have happened. So important to raise awareness of, such sad news and horrible that people have died due to their allergies. Great post. Thank you, I hope things will change and people will realise how serious allergies are. It's ridiculous that food isn't labeled correctly when it could be a matter of life and death. 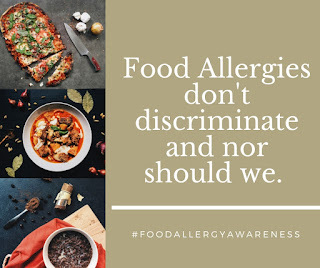 I have a non serious food allergy (I can't eat fermented foods or citrus fruits) and it's difficult enough trying to avoid those without taking in the repercussions of anaphylactic shock. It's such a minefield! I really hate the blame culture that we live in, everyone is so quick to judge and place blame it is really scary! Terrible that these deaths happened and we need to make sure that it does not happen again! It must be awful living with such extreme allergies especially as children. Hopefully things will change and quick! The only people who should have any sort of blame are the companies not labelling their food correctly and putting people at risk. Those poor parents.